This red velvet cupcake recipe makes moist, delicious cupcakes in no time at all. An easy cupcake recipe, it starts with a cake mix that is enhanced with ingredients that are traditional to red velvet. If you don't happen to have buttermilk on hand you can try this simple substitution. Place one tablespoon of lemon juice or white vinegar in an empty one cup measuring cup. Fill the measuring cup with milk to equal 1 cup. Let stand for 5 minutes, then use in any cake or cupcake recipe that calls for buttermilk. Be careful when working with the food coloring. It will easily stain your clothes and hands, so mix it into the batter slowly. Avoid using a plastic mixing bowl when using food coloring as the food coloring will stain plastic bowls. 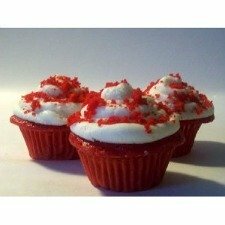 Perfect for Valentines Day cupcakes, this distinctly red cupcake with white cream cheese frosting looks as good as it tastes. For a really easy garnish that looks festive, crumble 1 - 2 unfrosted cupcakes into fine crumbs. Sprinkle the crumbs over the frosted cupcakes. 1. Preheat the oven to 350 degrees F. Line two (12-cups each) muffin pans with paper or foil cupcake liners. 2. In a large glass or ceramic bowl, add cake mix, buttermilk, water, oil, eggs and cocoa. Beat with mixer on low speed for 30 seconds, scraping bowl occasionally. Add the food coloring and slowly, carefully beat with the mixer set on low speed for 30 seconds, scraping bowl occasionally. Beat on medium speed 2 minutes, scraping bowl occasionally. Divide the batter evenly among the cupcake tins, filling about 2/3 full. 3. Bake cupcakes according to package directions. The cupcakes are done when a toothpick inserted into the center comes out clean. Remove from oven and cool completely before frosting. 4. To make the cream cheese frosting, in a large bowl, beat the cream cheese, butter and vanilla together until smooth. Add the powdered sugar and on low speed, beat until incorporated. Increase the mixer speed to high and mix until light and fluffy. 5. Frost the cooled cupcakes. For an easy garnish that looks good, crumble 1 - 2 unfrosted cupcakes into fine crumbs. Sprinkle the crumbs over the frosted cupcakes.